At Lucent Family Eye Care, we pride ourselves on optimal patient care through the use of the most technologically advanced equipment available. With this, our doctors along with our staff will ensure that you receive the care you deserve with high efficiency and precision. The Optos Daytona Optomap exam is fast, painless & comfortable. Nothing touches your eye at any time - suitable for the whole family. With Optomap our doctors can see a wider view of your retina without dilation and can detect many eye conditions such as Macular Degeneration, Diabetic Retinopathy, Retinal Detachments, and Macular Holes. This allows you to get on with your day without the hassle of the visual eyestrain due to light sensitivity and blurred vision. The retina is the only part of the body where you can see blood vessels without cutting into the body. An automated instrument which allows us to quickly and accurately measure the spectacle prescription of your glasses. We can also determine whether your sunglasses provide you with 100% UVA/UVB protection or not with this instrument. Estimates your refractive status for improved accuracy and efficiency during your prescription check with the optometrist. Measures the curvature (or the shape) of the front surface of your cornea. This measurement is of utmost importance when fitting all types of contact lenses. Uses a gentle puff of air to measure your eye pressure or intraocular pressure (IOP). The IOP is known to be a significant risk factor for glaucoma. An all-in-one letter chart that randomizes the letters that you read each time, ensuring an accurate representation of your level of vision. 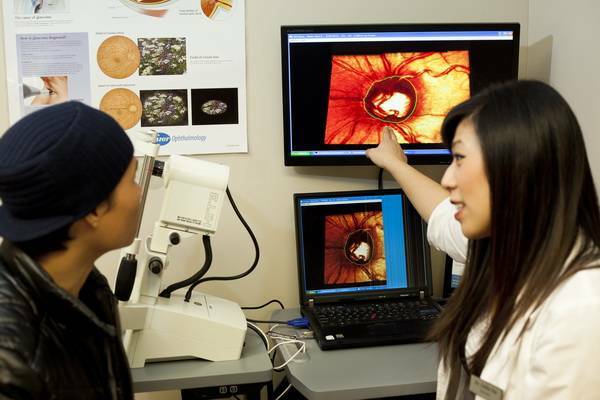 Takes a high-resolution photograph of your retina for documentation of any abnormalities on the inside of your eyes. Evaluates, in detail, your peripheral vision up to 120 degress in all directions. This instrument is considered the “gold standard” in glaucoma peripheral vision testing. Takes a 3-dimensional scan of the most important areas of your retina such as the optic nerve (for glaucoma monitoring) or your macula (for monitoring macular disease such as macular degeneration). This set of instruments precisely traces the shape of your frame and then sends the information to an instrument that cuts, shapes and smoothes the lenses to fit accurately into the frame that you have chosen. With this, we are able to decrease the wait time on your glasses and can even provide 1 hour service on many single vision prescriptions. This wonderfully created advanced design slit lamp gives a stunning optical performance to the evaluation of your eyes health. Our eye doctors can magnify your eye 40 times to see the detail in any eye disease, they can also visualize each blood cell traveling through the little veins in your eye!